Sorry for the long break, NICI-Mania is back! 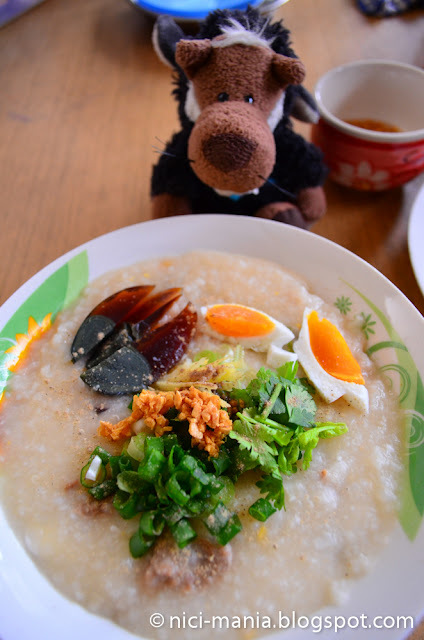 Today we are introducing the Century egg porridge recipe! 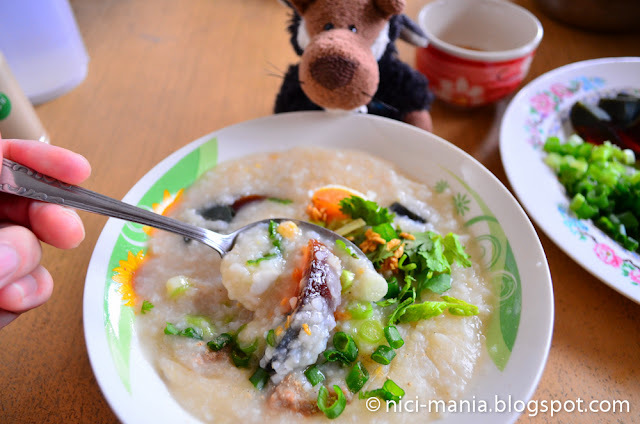 In dialect, century egg porridge is called "pi dan zhok". Whats unique about century egg porridge is this! 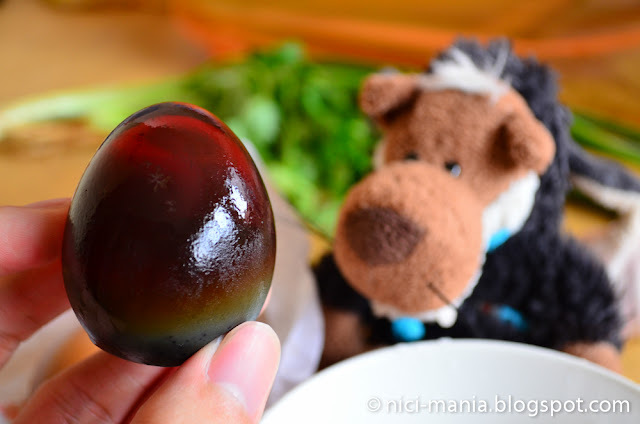 Century egg is a type of preserved duck egg, the color is brownish-greyish. Nowadays century eggs are made with chicken eggs too because of the cheaper cost. Notice the little snow flake or pine branch shape on the egg, that is one of the special features of the century egg. Unpeeled century egg on the left and peeled century egg on the right. 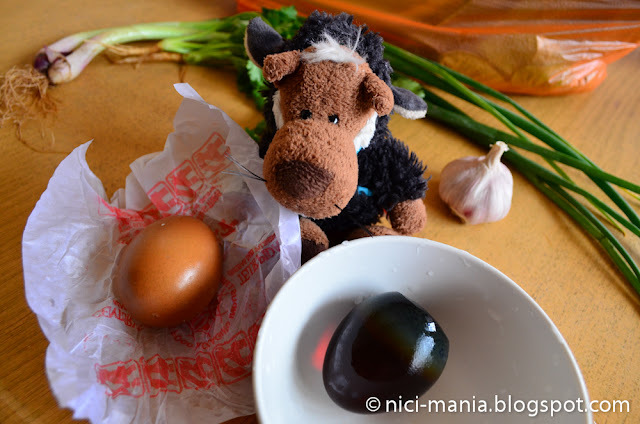 The most distinctive thing about century egg is the smelly ammonia odor, which is probably the reason why we grew up hearing urban legends that century eggs are made by preserving it in horse urine! We prefer duck century egg because the smelly odor is much stronger and the yolk texture is creamier. Century egg was once featured in Fear Factor in the exotic food segment. Can you imagine how surprised we were when we saw it on Fear Factor and how funny it was looking at the contestants eating the century egg like it was some worms or cockroaches. We like to call this, the blue cheese of eggs! 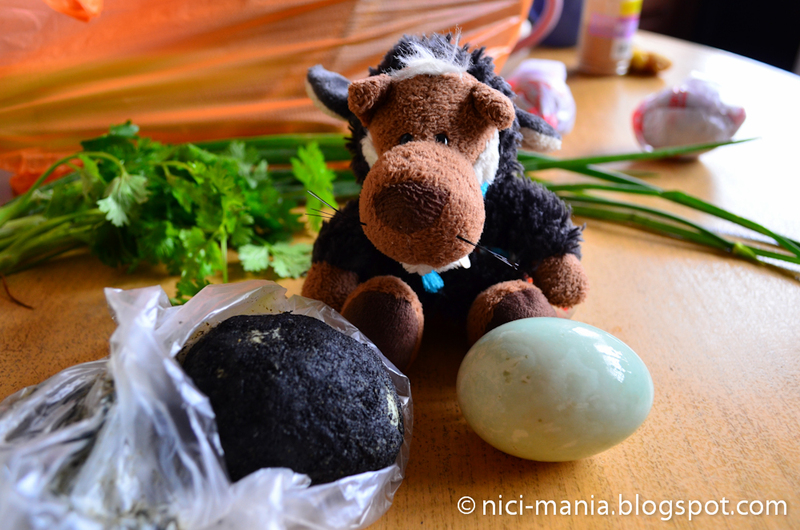 And frankly speaking, if you love blue cheese like us, century egg's odor is much easier to accept than blue cheese. Cooking century egg porridge is not as easy as cooking normal porridge. 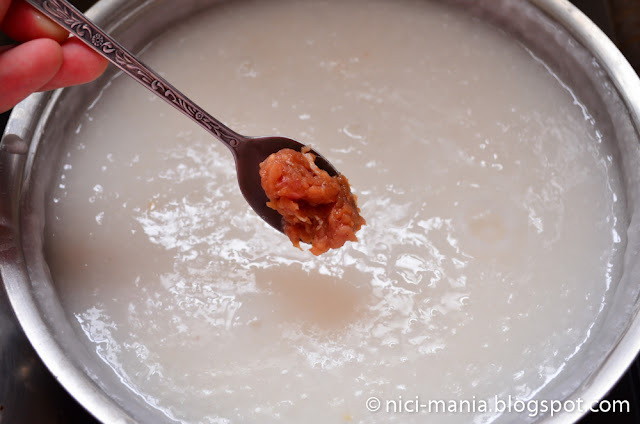 This is a type of Cantonese porridge and the special thing about Cantonese porridge is that the rice should be cooked until you don't see grains of rice in the porridge anymore and the porridge must be real smooth and buttery. This is our grandmother's authentic century egg porridge recipe. Very troublesome to cook but the taste is much better than anywhere else we have eaten. First and foremost, the rice must be prepared the night before. Wash 2 cups of rice, then drain away most of the water and pour in about 2 tablespoons of cooking oil, stir evenly. Soak pot overnight. 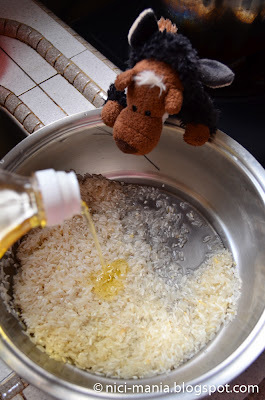 Soaking in oil is to enhance the smoothness and buttery texture of the porridge. 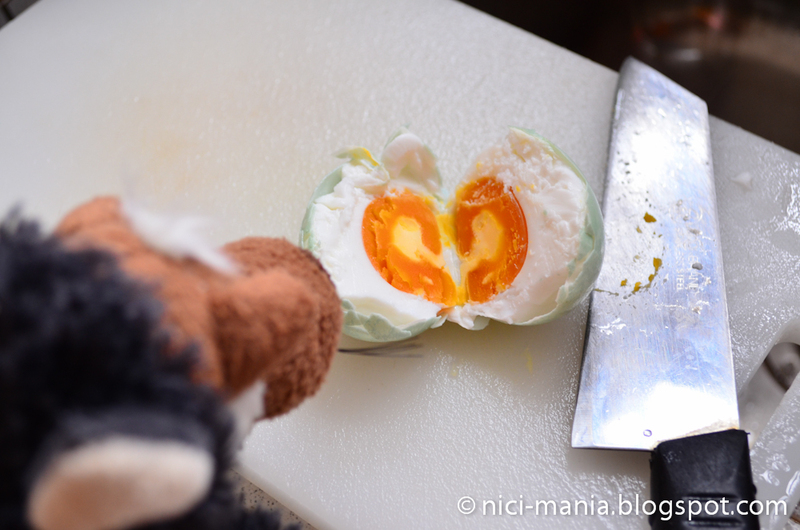 Next day morning, prepare 2 salted eggs. Salted eggs are BFF (best friends forever) with century eggs. Wash it thoroughly, you can even scrub the salted egg, just make sure the shell is immaculate. 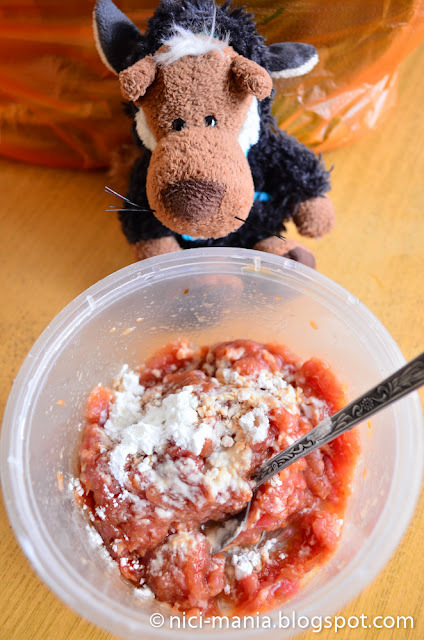 Prepare about 200 grams of minced meat. Marinate it with 2 tablespoons of soy sauce, 1 teaspoon of sesame oil, some pepper and some corn flour to make the minced meat more tender. 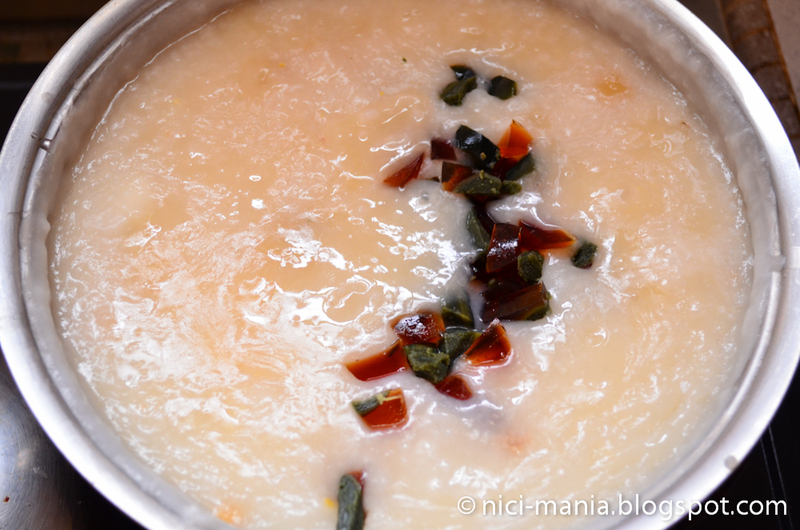 While your pot of porridge is brought to boil, chop 2 thick slices of ginger and add it into the pot. As soon as the porridge starts to boil, switch to low fire and keep stirring every few minutes. 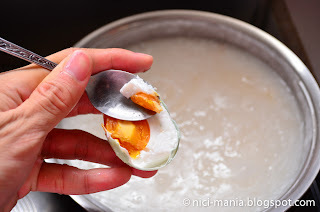 Add in the 2 salted eggs with shell on into the pot to cook together with the porridge. That's why we reminded you to wash the salted eggs clean earlier. You may boil the salted eggs in another pot but this is our grandmother's style of cooking the salted eggs. 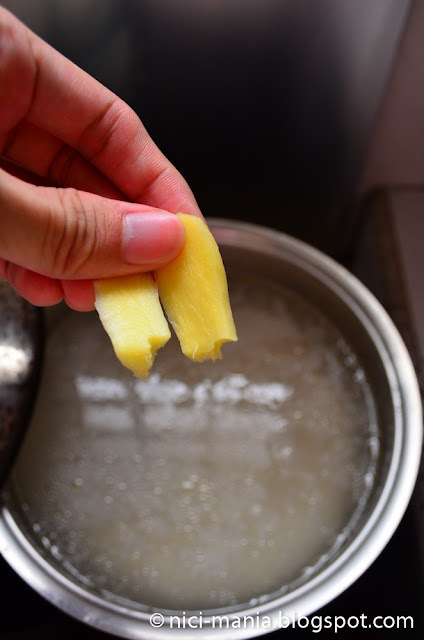 The continuous stirring is what makes cooking the century egg porridge quite a tedious task as you have to remind yourself to keep stirring the porridge while you prepare the ingredients. This process takes about 45 minutes while cooking normal porridge only takes 5 minutes of boiling. 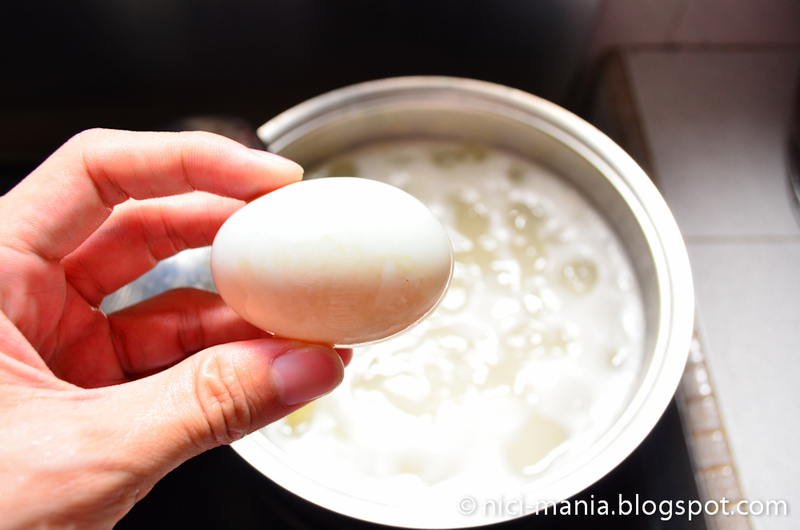 You should remove the salted eggs after 10 minutes of boiling. 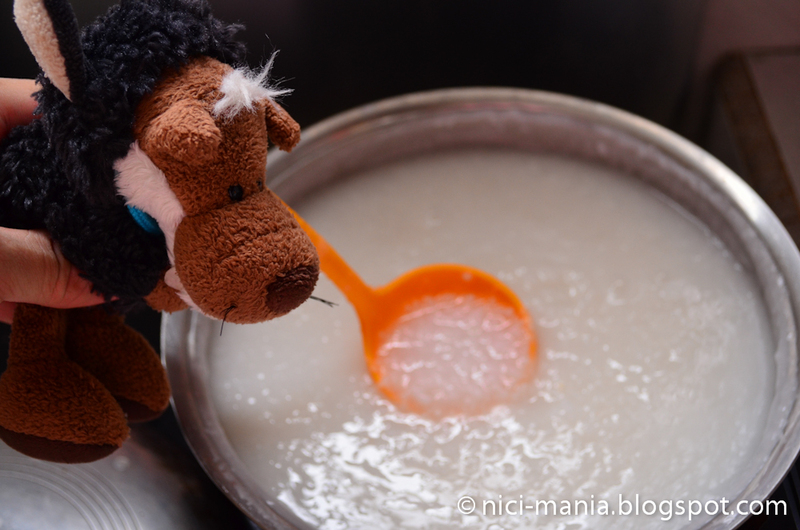 If you find the porridge is too creamy, it is advisable to add more water. Notice our pot of century egg porridge has nothing in it after cooking for so long but look how smooth and creamy our porridge has become! 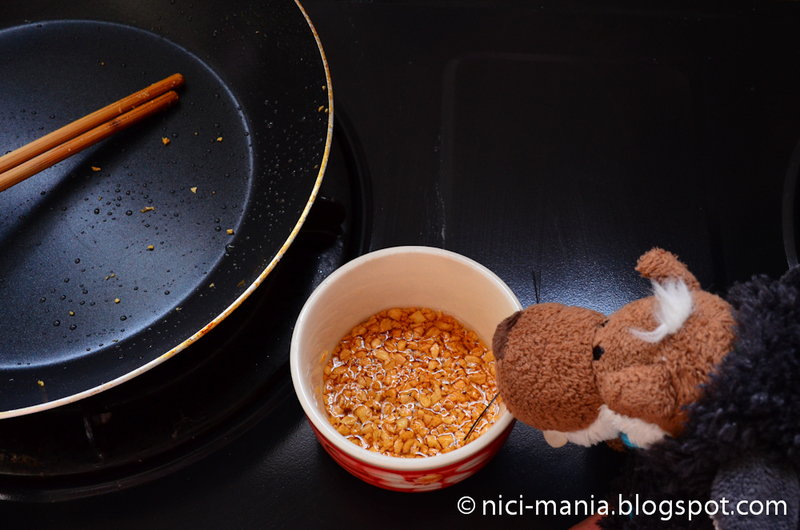 Now when the porridge is ready, its time to start adding ingredients for example the minced meat first. Chop the salted eggs into half with a knife, its much easier than peeling the shell. Take one of the salted eggs, dig it out from half the shell in cubes and add them into the porridge. Finally we add one century egg into the porridge. 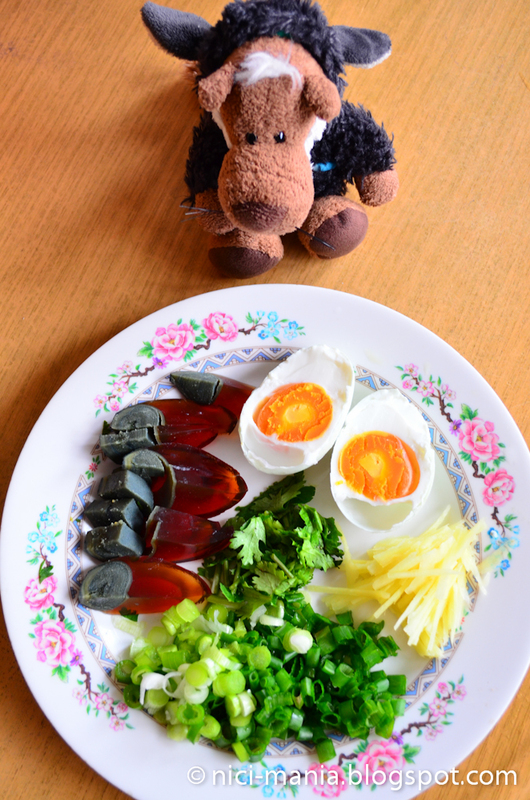 You don't need to cook the century eggs, they are eaten raw. Now you can start adding salt and any seasoning you want into the porridge. You may use some chicken stock power to give it more flavor but our grandmother uses MSG. 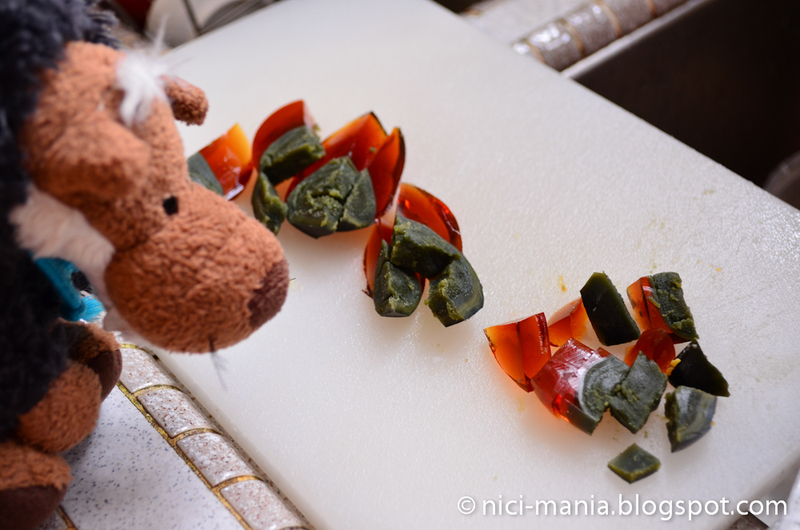 Slice up the other century egg and salted egg. Dice some spring onions, chinese coriander leaves and cut the ginger in long thin shreds. 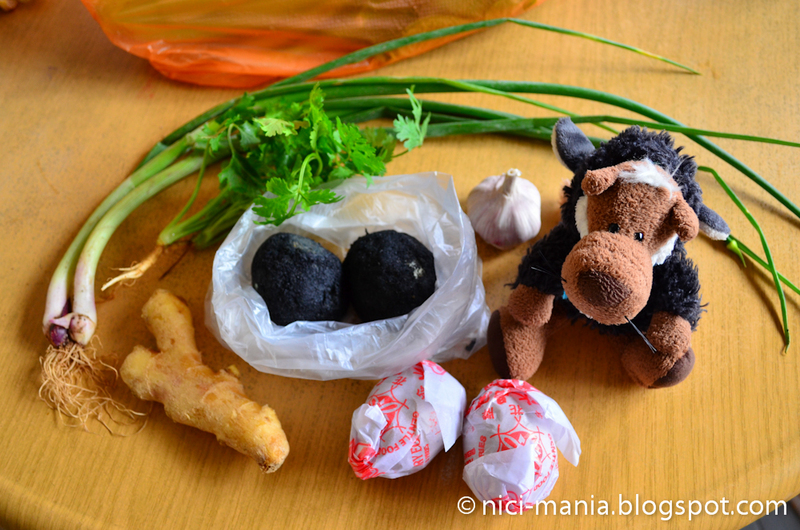 Set these ingredients all in one plate, they are to be used to dressing and toppings for the century egg porridge. Chop up the garlic and fry them in oil to make crispy garlic oil. This is a mandatory as it makes the century egg porridge so much tastier. Scoop a bowl of century egg porridge from the pot, top it with spring onion, coriander, ginger, garlic oil, more century egg, salted eggs, some soy sauce, sesame oil and pepper. Your century egg porridge is done. Hope you liked our century egg porridge recipe today! I think that is not our taste. But I would try it. Woooaaaah, if we lived near you, we would definitely ask if we could come over for dinner! Thanks again for the great pics! The love you have for food and cooking is amazing! It looks delicious!!! I always get hungry watching your blog haha. I am following your stories since last year and I really appreciate the high quality photos with really fun stories. Everything is nicely and neatly done and really inviting to look through it all. Especially I like the fact that one learns lots about Singaporean/Malaysian culture. It almost feels like one is on a tour with a local tour guide. Please keep it up! All the best wishes from UK! It is interesting that you boil the egg in the porridge. I wish to try your recipe, looks so yummy..! Thank you for sharing..